You can use a variety of tools to refine your Plastimake object once it has cooled and hardened. Some tools generate enough heat from friction to soften Plastimake. When using power tools such as a drill, use a low speed setting so the cutting edge doesn’t get too hot. You'll get a much cleaner result that way. Stanley knife – A Stanley knife with a sharp blade is the ideal tool for carving Plastimake and cleanly cutting through small pieces. Drill – Use a sharp drill bit at a slow speed setting to drill a nice clean hole through your Plastimake object. If you drill too fast, the friction will cause the surrounding Plastimake to soften and distort. Saw - Slow, even strokes with a sharp saw will cut through solid Plastimake quite well. Saws are most useful for cutting through thick blocks of solid Plastimake. Tin snips - Great for roughly cutting up left over pieces of Plastimake into smaller pieces so that it softens faster in hot water. Scissors – Scissors are most effective with thin sheets. 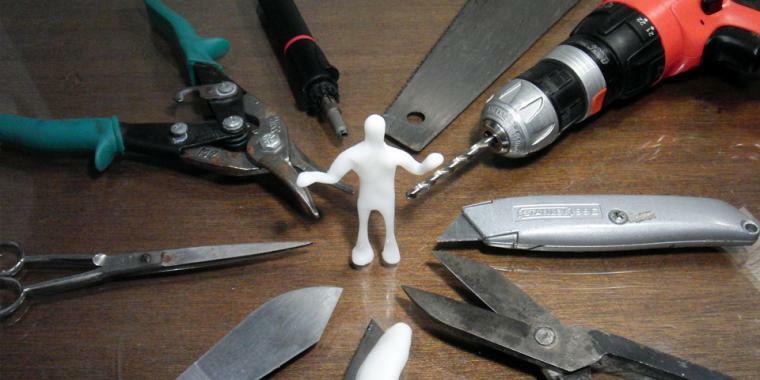 Using sharp scissors you can accurately cut shapes out of a 2mm thick sheet of Plastimake. We’re often asked whether it’s possible to use sandpaper on a Plastimake object. It is possible to sand Plastimake, but it’s usually not the best method. Sandpaper generates a lot of friction heat, which causes the edges of the Plastimake object to burr, producing a messy result. Instead, try re-heating the surface of the object and scraping away any unwanted Plastimake while it’s still soft.